The great lost album of country music! 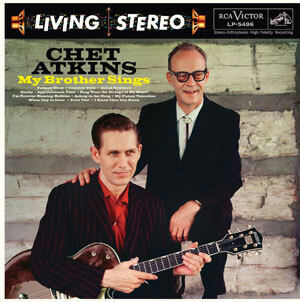 Recorded at the then-new RCA Victor Studio B in Nashville, this amazing collection of Chet Atkins with brother Jim on vocals was cancelled before release, and the very few existing copies are now multi-thousand-dollar rarities, with one selling in 2012 for an astounding $8,100! Taped as a test for the brand-new Ampex machines and custom RCA mixing console at the facility, the sessions--intended simply for demonstration purposes--turned out so well that Chet developed the My Brother Sings LP around them--it was mastered, designed and pressed well before trouble arose, and nobody's certain now why the disc was rejected. It was not for quality reasons, though, as it is a document of one of the genre's leading lights in a close-to-his-heart setting that reflects the collective artistic voice that family artistry fosters. Stunning, true stereo recordings from 1958, with a jacket that reproduces what an actual Living Stereo cover would look like based on a single exisiting proof--only mono copies have been found! This is a first-time issue for a stunning Chet set as originally intended, and is an R.T.I. pressing from the pristine, original masters--join the family!